Fly fishing spots literally line the highways and byways in the area and they are teeming with rainbow, brown and speckled trout, making this a preferred destination for fly fishing devotees around the southeast. Most streams don't require much rigorous hiking to gain access to the 'hot spots' but there are a few that require a day trip in the woods. Going fly fishing in many of the areas throughout Banner Elk is a great way to get out and enjoy the mountains, and many of the best hidden spots offer gorgeous sights and sounds of the area. On this page we've provided the contact information for many of the local guide and tackle shops that can give you advice on the places to go and what to look for. When looking for the hidden and tucked away fly fishing spots in the High Country, please be careful not to fish on private property. 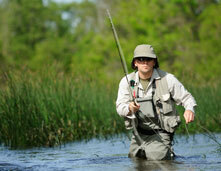 Many private land owners do allow fishing on their property and it is important to respect this courtesy. Be respectful and obey the old adage 'if you pack it in take it with you when you leave'. Obey all 'no trespassing' and respect property. The Banner Elk NC Real Estate we list is located near all of the well-stocked streams in the NC mountains. When you buy a gorgeous NC mountain home in Banner Elk, Linville or one of the lovely surrounding resort areas you'll enjoy a mountain lifestyle you simply cannot find anywhere else. Come to the mountains and discover all the NC Blue Ridge Mountains have to offer. If you're looking for adventure, another way to enjoy the rivers in the High Country and Banner Elk is whitewater rafting. 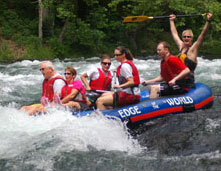 The Watauga River is probably the most popular river in the area, and is ideal for families. The great thing about the Watauga River is that the flow is dam controlled, meaning that water levels are guaranteed to be ideal from spring to fall! Another great river in Western North Carolina is the Nolichucky, considered by many to be one of the best whitewater runs in the nation. The Nolichucky offers some of the most challenging rapids in the eastern United States, so it is not recommended for the faint of heart! There are several outfitters in the area that offer guided trips down the Watauga Nolichucky, and others, including Extreme, Ski Country, Edge of the World, and Wahoo's.